With this version BB has maintained his signature TV Style Cut but this time has forgone with the usual TOS music soundtrack and fully embraced the glorious film score of Jerry Goldsmith. Additionally, many of the poor F/X shots have been cut or replaced. With these changes, Bionic Bob hopes to have created an adventure worthy of the Star Trek Universe! 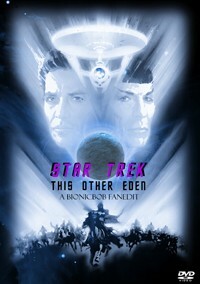 SYNOPSIS: A Madman hijacks the Enterprise in his quest to find GOD! – altered Jail Break, no Turbo Shaft/Rocket Boots!!!! – altered/clarified final encounter between Kirk and the God-Thing. At this point my reviews of BionicBob's Star Trek edits are borderline embarrassing, but once again, I enjoyed the heck out of this. I can't imagine anyone is going to start with this edit instead of watching them in order, so I will just direct you to my previous 4 reviews---they are all great. These are fantastic edits of flawed movies and, in every single case, BionicBob's edit lessens the flaws and makes the movie more enjoyable. 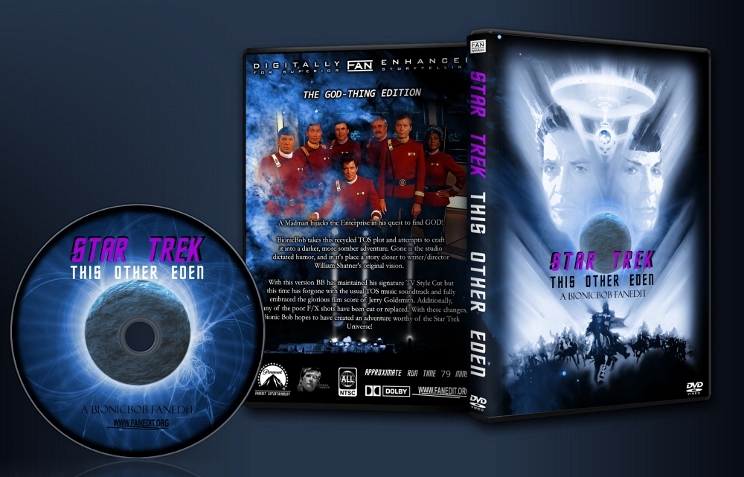 Anyone who is/was a fan of TOS on TV or of TOS of movies will NEED to watch these. I've nothing negative to say, and I have already gushed enough in my previous reviews. Just saying the name conjures up all sorts of things: good (in some cases, great) and bad (in some cases, very bad). His Captain Kirk in the original series was for the most part wonderful - and of course has been long part of pop culture. His performances in the films hit or miss. So it goes without saying that as actor, writer and director he would bring himself -- the good and the bad (as do we all) to that enterprise (bad pun unfortunately intended...). "Star Trek V" is still maligned to this day. It's a frustrating view, even for (perhaps mostly for) Trek: the original series fans of which I'm one - because there's a great TREK movie here, hidden amongst some of the woefully clumsy acting, overwrought/clunky direction, hammy acting and mostly - the completely misfired 'comedy' elements. Bionic Bob, in his iconic 'TV style' editing has turned an off-putting TREK movie into a highly enjoyable TV movie - every original series TREK fan should see what Bob has done here. There are some GREAT surprises for fans of the show. And after watching Bob's version, you're left scratching your head on why the Paramount suits or Shatner didn't include some of what Bob adds into the film. I never would've thought of these, but upon seeing Bob's version, they are highly pertinent moments that belong in the official version of the film. Why Bob even makes sense out of the abbreviated, daffy Klingon scenes! Now THAT takes some imagination. If you love the original series, make time to watch Bob's take here. Great stuff! A much improved Star Trek 5. I’ve only seen Trek V once so I wasn’t completely certain of everything cut but it flowed a lot smoother this time. I wasn’t a big fan of the commercial breaks, even though they didn’t bother me in earlier BB Trek edits. Editing was good but some things felt odd (don’t ask me what, I’m a terrible reviewer).